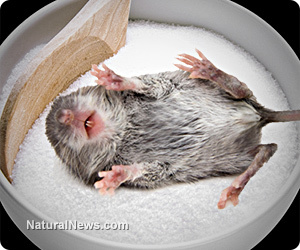 (NaturalNews) In what is arguably the most shocking food study conducted since the Seralini "GMO rats" study released last year, researchers at the University of Utah have found that even a small amount of refined sugar consumption resulted in a doubling of the death rate of female mice. Fed merely the equivalent of three cans of soda a day, females experienced a 100% increase in death rates, and males experienced a sharp drop in fertility. Males were also found to have impaired ability to hold territory, according to the study authors. One of the study authors, James Ruff, explained that even though the mice did not show observable symptoms of obesity or diabetes, a careful monitoring of their behavior showed that they died more frequently and reproduced less frequently. The study was brilliantly designed to mimic the real-world competitive living environment among mice, forcing them to compete for territory (nesting beds) and reproductive partners. Interestingly, the study found that the toxic effect of feeding the mice refined white sugar was equal to being inbred mice (i.e. offspring of first cousins). Think about that for a minute: sugar makes mice dumber than if their parents were cousins! There is no question that the widespread consumption of all these sugars is a primary cause behind the epidemic of diabetes and obesity under which America is currently suffering. Aside from the obvious sources of sugar (sodas, sugary cereals, pastries, candy, etc. ), refined sugar is also hidden in everyday grocery items like pizza sauce, salad dressing and even wheat bread. Why is refined white sugar so bad for your health? Because it's an "anti-food" that has been stripped of nearly all nutrition. Sugar is refined from cane, a large species of grass. Raw cane juice is actually a dark green liquid with an incredibly sweet, full-spectrum flavor. Processing the raw cane juice into sugar involves removing nearly all the vitamins, minerals and phytonutrients, leaving only empty white calories that are a lot like poison to mammalian biology. That's why "dehydrated cane juice crystals" are actually good for you, even though "refined white sugar" is bad for you. Cane juice is a full-spectrum sweetener that provides all sorts of minerals and nutrients which help balance the blood sugar effects of consuming sugar in the first place. But the real root cause of most disease is nutrient depletion thanks to the routine consumption of nutrient-depleted, processed refined foods. If you currently crave these things, it's usually because you're utterly deficient in mineral nutrition. Your body is starving for minerals and tells you to keep eating until you get some. But because the foods you're eating have no real nutrition, you just keep packing on the pounds as the calories mount up. What you really need is real nutrition that turns off the hunger. That only comes from high-density, full-spectrum superfoods and food-based nutritional supplements. That's why I can honestly tell you, without hesitation, that I gave up drinking soda well over a decade ago, and to this day, I do not ever crave soda. I don't crave ice cream, cake, donuts or any such sweets. This is important to understand because if you eat a diet like mine, you don't need any self control whatsoever to avoid sweets. Your body automatically doesn't want them. The reason I don't eat sweets, in other words, is because I don't feel like eating sweets, not because of some amazing form of self-discipline. Often, successful dieting is not a matter of self control but a matter of strategic dietary choices and nutritional supplementation to make sure your body gets the nutrition what it needs so that your inherent nutritional hunger is satiated. If you really want the kind of nutrition that satisfied your body's cravings for minerals, grow your own food in mineral-rich soils or buy food from your local farmer's market. You may also benefit from superfoods or mineral-rich food concentrate supplements, both of which have much higher nutrient density than run-of-the-mill grocery foods.